David Byrne's Talking Heads must surely have appealed to everyone who like me was 13 or 14 when "Road To Nowhere" was released. As well as the catchy tune, their use of these new-fangled video things was pretty unique and memorable. They were at their peak before I was actively buying records or going to concerts, so I was a Johnny-come-lately to David Byrne's output. I have though bought much of what he has been doing over the past 20 years, including stuff like his "Young Adam" soundtrack and his excellent book from last year "How Music Works". So I jumped at the chance of seeing Mr Byrne performing at Glasgow Royal Concert Hall this week. As well as coming over as effortlessly cool and groovy he is, of course, essentially Scottish (these two facts are not unrelated). Born in Dumbarton his family emigrated to America when he was only 2 years old, but we know that he was back in the mother country last night, even if he was too serene to make any mention of it. Whatever reason we were there for he had a full house at the Glasgow Royal Concert Hall. 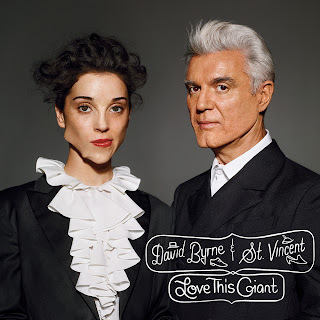 The current album he is touring with is "Love This Giant" a collaboration with St. Vincent (Annie Clark). Her last album, Strange Mercy, is worth looking up if you haven't come across it already. Love This Giant is a complicated collection with slick production and lots of brass, so I was intrigued to see how they'd do this live. As it turns out they did it with slick production and lots of brass. 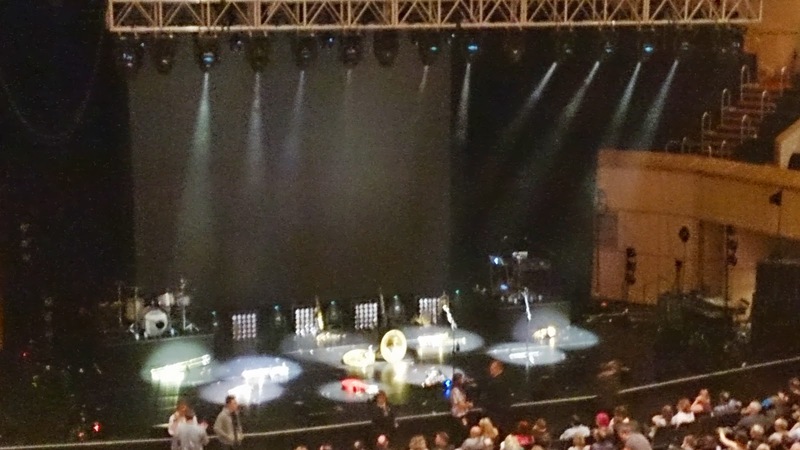 He wanted you to sit and watch, so started with an announcement asking people to take photos if they wanted but not to watch the show through "a device", blocking everyone else's view - a request greeted with a heartfelt round of applause. (I'm fed up watching a band between a wee cluster of the people's phone screens). It was good to get a smattering of the solo material from both of them in amongst almost all the tracks of their joint album. St. Vincent's "Cheerleader" and his "Lazy" were stand outs. Talking Heads' "Wild, Wild Life" also featured, which apparently he hasn't performed live until doing this tour despite releasing it in 1986. The crowd of the venerable Concert Hall were on their feet for the encores which included "Burning Down The House" and finished with "Road To Nowhere" snaking around the stage with a brass band conga. A great show and great performances all round.